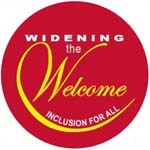 Kelli’s article on Widening the Welcome has been republished in the Connecting Voices e-magazine. Connecting Voices has all sorts of great news of the happenings within the Southern California/Nevada Conference of the United Church of Christ. Read the Connecting Voices article here. Also, watch for more such material to appear here on WWSIC in coming months. This entry was posted in Disability Ministry, In the Media and tagged widening the welcome.